The deal Putin has offered plays off of Obama's nonproliferation interests and keeps Assad in power. 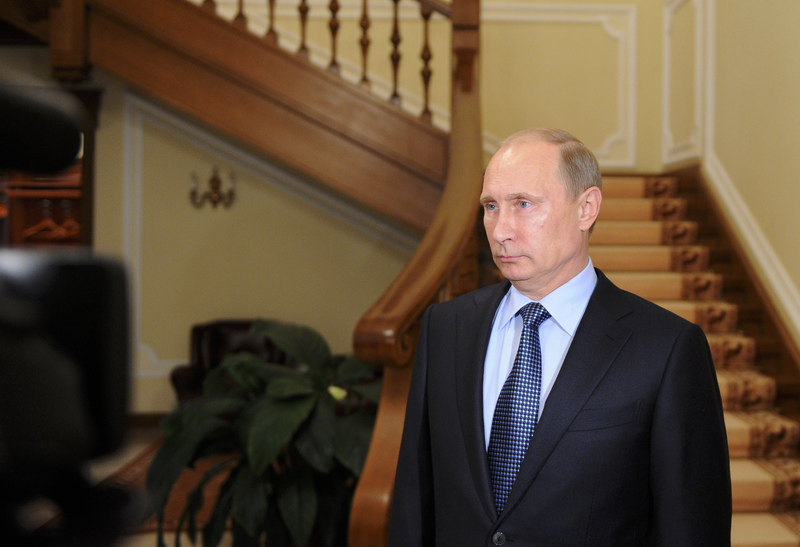 Vladimir Putin wants to keep Syrian dictator Bashar al-Assad in power. The best way to do that is to preserve Assad’s maximum military advantage over rebel forces. It would also suit Putin to enhance Assad’s legitimacy on the world stage. The deal offered by the Russian president and rapidly endorsed by Assad achieves all three of these goals. Assad reigns supreme in Damascus, retains all of his conventional-military might, and is enlarged on the world stage as an enlightened soul willing to hand over chemical weapons—even after using them to murderous effect on Aug. 21. The deal, as currently structured, has the added benefit of appearing the world over as a case where Syria, with its authoritarian puppet master Russia pulling the strings, has stared down the American military colossus. This is all possible because Putin knows that one of President Obama’s central foreign policy goals is to reduce nuclear and chemical weapons. Pursuing nonproliferation is how Obama sought to “reset” relations with Russia, and he still considers New START to be one of his great foreign policy accomplishments. Putin knows this, because he was the co-negotiator of the treaty in his capacity as prime minister while Dmitri Medvedev served as Russia’s president. Putin watched as Obama offered no serious military support to anti-Assad rebels while civil war raged for more than two years. After the White House declared in April that Assad had twice used chemical weapons, it promised new military aid for the rebels. That amounted to MREs and medical kits. The White House and some in Congress fear putting lethal arms into the hands of jihadist extremists within the opposition forces. But experts who have traveled to Syria argue that the White House could find moderate rebel forces and arm them if that, in fact, was a priority. Meanwhile, Putin knows how to measure intent, muscle, guile, and leverage. Dithering mixed with MREs and medical kits has told him plenty. Obama’s reluctance to wage war in Syria is understandable. Unlike the war on terrorism that he inherited, this would be a war of his own choosing, and he would own the results and repercussions. Expanding the use of Bush-era drones was a largely hidden escalation of the war on terrorism. Broadening the reach of Bush-era electronic surveillance of phone calls and Internet traffic has proved embarrassing and politically problematic for Obama. But going to war and owning the likely blowback in the region or on America’s shores gave the White House considerable pause. This was one of the many reasons Obama sought shelter in Congress. But Congress heard from Americans of all political stripes, and they told senators and House members that they want no part of a “limited, targeted, and proportionate” war. Average Americans knew in their marrow that launching missiles is an act of war. Obama has spoken lately of war weariness. Americans are not weary. They are exhausted, terrified, and besieged. After a week of constant administration lobbying, public opposition to war in Syria hardened. Phone calls and e-mails to House and Senate offices are not just running 10-to-1 against missile strikes. They are not running 20-to-1 against. In some cases, they are running 1,500-to-1 or 4,000-to-1 against military action. That’s why, after briefing 93 senators on the military plans and on intelligence about the Aug. 21 chemical-weapons attack in Syria, the White House has less support in the Democratically controlled Senate than before the briefings started. The briefings are not meaningless. But they are no match for real constituents from across the ideological spectrum who are screaming at Congress to withhold authorization. Putin knows Congress is wavering and Obama is hesitant. And he knows how Obama prioritizes nonproliferation. Putin’s gambit is to lure Obama into a compromise over Assad’s chemical-weapons stockpiles that achieves virtually all of Russia’s goals and extricates Obama from a tight political spot. First, Russia’s opening bid is for the U.N. Security Council to approve a nonbinding resolution asking Syria to hand over all of its chemical weapons to international inspectors for eventual destruction. Putin knows that’s unacceptable to Obama. He will want something back in the inevitable diplomatic horse trading. There is every indication Russia wants to use a chemical-weapons deal to complete all pending arms sales to Syria (see S-300 antiaircraft weapons) and possibly negotiate more arms sales. Conventional arms, clearly, are not an overriding concern to Obama. They have been used to kill more than 110,000 civilians and keep Assad in power. Second, any deal that elevates Assad to chemical-weapons quartermaster is fraught with peril. Assad did not acquire chemical weapons as a lark, and no matter how much U.S., Israeli, British, and French intelligence believes it knows about Assad’s stockpiles, only the dictator and his experts know for sure. They would have every incentive to withhold just enough lethal weapons for extenuating circumstances in exchange for retaining power and keeping the conventional-weapons pipeline to Russia open. Plus, in terms of cost, manpower, and unyielding attention to detail, it would be incredibly difficult to make this proposal work. Third, any Russia-Syria deal that defuses the crisis and wins U.N. backing elevates Syria as a regional player and vindicates Russia’s strategy of using its Security Council veto power to thwart U.S. military intentions, to achieve its political aims, and to redirect international action away from sanctioning the use of chemical weapons to making the stockpiles a post-massacre bargaining chip. These risks appear to lopsidedly favor Russia and Syria. It is not clear the two nations will succeed. It is clear Obama is taking them seriously. It is equally clear the Senate and House will not back a military strike at this time. We may be in for weeks of diplomatic haggling about Syria’s chemical weapons and how, if at all, the U.S. and the world can be sure it’s not taking a bad deal because it has no realistic political or military alternative. Putin, for now, holds the trump card.